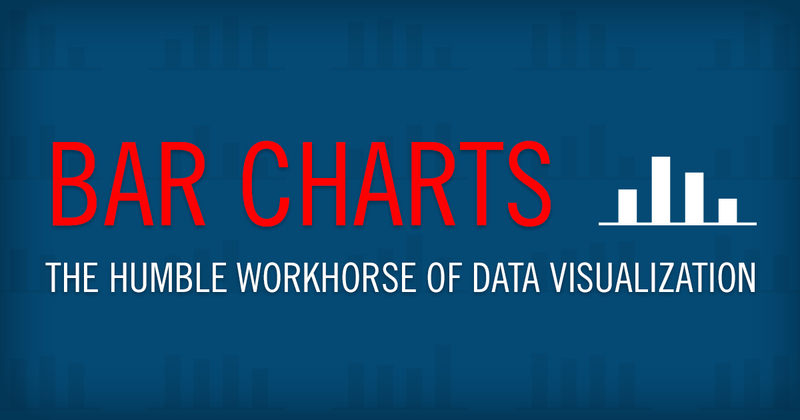 The humble workhorse of data visualization. When it comes to visualizing data the chart type I rely on the most is the bar chart. There is even a running line of commentary on the Demos & Best Practices team on how much we use them. But that withstanding, we keep using them. The bar chart is just incredibly effective. One reason I prefer bar charts is that they are easily understood by users of all levels of data literacy. There is little need for explanatory text with bar charts which helps save space. This allows us to effectively and efficiently communicate to a wide audience which is important when you aren’t sure who will end up using an application after it is released. Another advantage is that they are a great way to display a list of values of almost limitless length. Unlike pie charts which cease to be very effective after several slices, or line charts that are hard to read when there are too many lines, bar charts can accommodate tens to hundreds of bars. When sorted according to value they communicate the hierarchy within the data without overcrowding the space. As for the orientation we prefer horizontal, rather than vertical. An advantage of horizontal bar charts is their flexibility in displaying bar labels. There is ample room to accommodate short as well as long bar labels which is better than truncated text or other space saving methods. In mashup apps you can assign a fixed height to a bar chart which dictates how many bars a user will see before having to scroll. In general, people like to see Top / Bottom lists of categories. What are the Top 10 selling products? What are the 5 worst performing regions? A horizontal bar chart with a fixed height is a useful way to give users a quick Top 10 list (or whatever number you want). Once an app has a quick list on some topic, users may not even feel the need to scroll but they always have the ability to do so. As for criticism, probably the biggest one for bar charts is that they don’t have a big “wow” factor. Because they are so ubiquitous, bar charts are often overlooked. Misguided attempts to make bar charts more exciting lead to things such as 3D bar charts which are harder to read and less effective than standard ones. If you are looking to add some excitement to your app: consider adding flair in other ways. Instead of tricking out your bar charts you could instead have one really cool chart on the page that is then supported by quieter, but very useful, ordinary charts. For our team, those humble supporting charts doing most of the heavy lifting tend to be, you guessed it...bar charts.